If Selma sticks to subtlety and inference -- illustration over flat prose -- American Sniper is something of the inverse. It remains surprising to me how much box office and media attention this film has received since its release. We know it raked in a tremendous amount of cash, we know that many rallied to argue about Chris Kyle's place as a hero or the film's relationship to a type of nationalist propaganda. My parents and older relatives were among those who seemed to find the film emotional and moving, even as others I knew dismissed it as an inaccurate portrayal of a man who -- in his own words -- depicted himself as something more superego than patriotic martyr. To be perfectly honest, I found (and continue to find) it difficult to speak to either experience. I can't tell you who the real Kyle was, I can't say I found the film to even be particularly patriotic. All I can judge is that the character on screen, the version of Kyle played by Bradley Cooper, and what I saw did not read as particularly conservative or liberal. The character may certainly have his own beliefs, but the film felt less like a hero-worshiping construct and more like a ringing antiwar reminder. 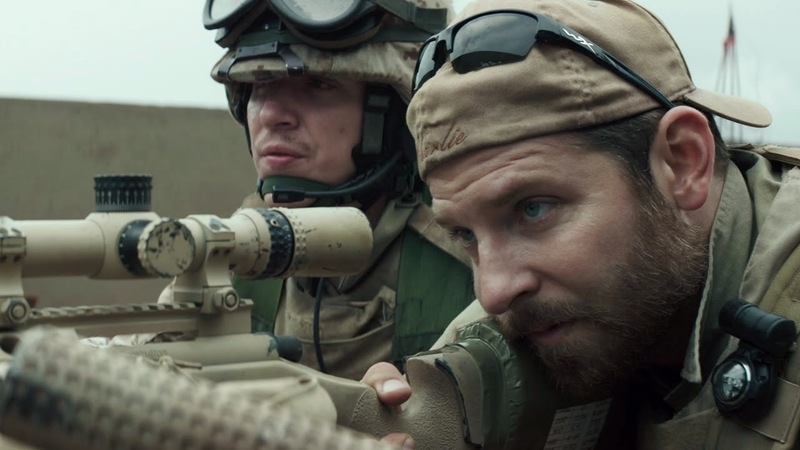 Frankly, if American Sniper does anything it makes "serving your country" look downright terrible. For all of Kyle's "successes" on the field we see just as many failures. Kids are killed, families are torn apart, he loses friend after friend to injury and PTSD-induced suicide. Though he's particularly skilled at killing, the repeated refrain of the film seemed to be "hey, look, this guy is kind of messed up, right?" Cooper plays him as someone struggling, warped, and incapable of living in peaceful spaces. Though Cooper's version of Kyle is often almost unsympathetic, the film's problem is perhaps that the character is given a little less credit than the cinematic moments spent in modern warfare. There are a surplus of combat/sniping/mission sequences in this film, and as the movie starts to construct a similarly skilled "super villain" sniper for Kyle to square off against, the messages become mixed. Kyle vs. another sniper is a one-man, one-goal mission that doesn't square well with me. Though it's possible to read the obsessive nature of Kyle's returns to the military as quietly gesturing toward a larger problem, the film's visible love of the combat sequences seems to ask us to forget how thoroughly messed up Kyle has become and to think of him as a true "army of one." In these later scenes, the juxtaposition of Kyle's emotionally crippled home life against repeat tours of duty creates a mash up of mixed messages. Sniper grows sad, weird, and confusing -- disturbing almost because it's just too much, and because it can't decide what Kyle is or how we should view him. The real truth is that while it may be conflicted, it's not a particularly interesting or unique conflict. We have a surplus of films that speak to precisely Kyle's dilemma, often without the burden of having to respect a deceased subject. Facts are the things that get in the way here, and what prevents the film from spending sustained time in one space or another. The actors are in a choke hold here, and the film is less riveting than uncomfortable.